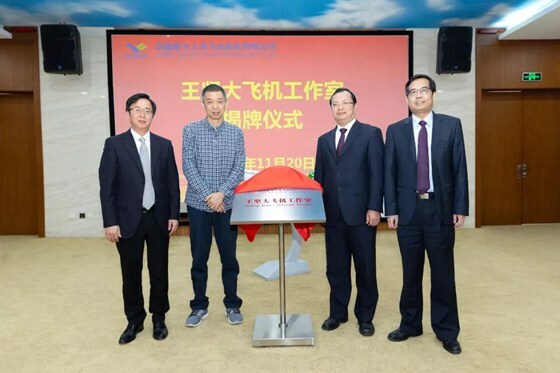 COMAC joins hands with Alibaba to explore intelligent commercial aircraft manufacturing__Commercial Aircraft Corporation of China, Ltd.
Wang Jian's Aircraft Studio was unveiled on November 20th, 2018. Wang Jian's Aircraft Studio was established in the Assembly Manufacturing Center of Commercial Aircraft Corporation of China, Ltd. (COMAC) on November 20th, 2018, aiming to promote the deep integration of intelligent manufacturing technology and commercial aircraft manufacturing. Mr. Zhou Xinmin, Member of Standing Committee of the Party Committee and Vice President of COMAC, and Mr. Wang Jian, Chairman of Technical Committee of Alibaba Group, attended the unveiling ceremony. Mr. Wang Jian is the Founder of Alicloud, a cloud computing brand of Alibaba Group, and is also the originator of the concept of "City Brain". Wang Jian's Aircraft Studio will focus on COMAC's phase objectives of "Three Ones" for the 100th Anniversary of the Founding of the Chinese Communist Party, promote manufacturing by data, solve the problems affecting production capacity improvement in commercial aircraft manufacturing, realize optimized process design, intelligent production scheduling, precise logistics distribution, optimized quality control and transparent management decisions by data, and finally realize the creation of value by data. Previously, the Assembly Manufacturing Center of COMAC and Alibaba had discussed and exchanged views on jointly promoting the pilot applications of big data in industrial fields and jointly constructing a "Factory Brain" characterized in large-scale production, which laid a good foundation for the cooperation between both sides in building a smart factory. Mr. Wang Jian expressed that in the cooperation, both sides would use data to create new "wings" for the development of commercial aircraft, promote the continuous integration of Internet and commercial aircraft manufacturing industry through joint discussion and argumentation, and promote the development of the trunk liner career.